A quick post to share some seasonal joy. Our year began a bit dark and uncertain. I don’t need to rehash it all. But it is closing with so much love and light and good stuff — we’re bursting. It feels great! On December 1, Dave learned that his 6-month post treatment scans were clear. Roger — the sinister tumor that was — stayed away. Nothing new was lurking. What an incredible way to come off of our post-Thanksgiving fullness and enter December with a good dose of happy. And relief. We didn’t want to assume that we would get this result. I guess we’ll always go to each oncology appointment prepared to accept whatever news. But to watch Dave receive the word that yes things looked good was the best present ever. Year one is complete. Dave used the good news (and the mild temps) to channel his inner elf-likeness. Lights, decorations, music, soup… everything he somewhat ‘missed’ last year he made up for in double-time. Before my eyes, our house took on an enchanted, bustling feeling. It’s been fun to just hunker down and enjoy every moment of it. And the tree looks quite awesome. I couldn’t resist taking a nap underneath its magical boughs with the cats. Mmmm… tree naps. 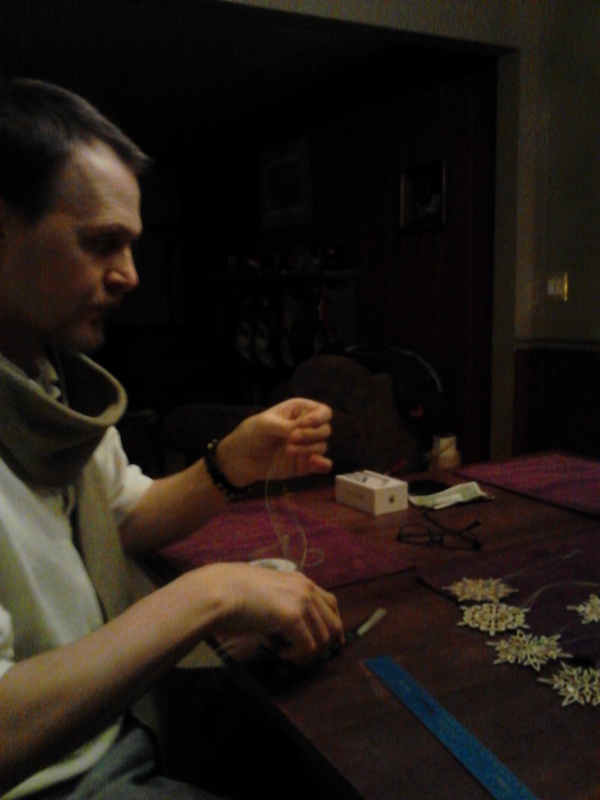 This burst of activity also became the catalyst for a new thing to try — crafting. We wanted to make something to express how much we appreciated those who stood by us throughout this crazy year. It took a bit of sourcing and several nights of therapeutic assembly but the end results make us smile. Behold — ornaments. 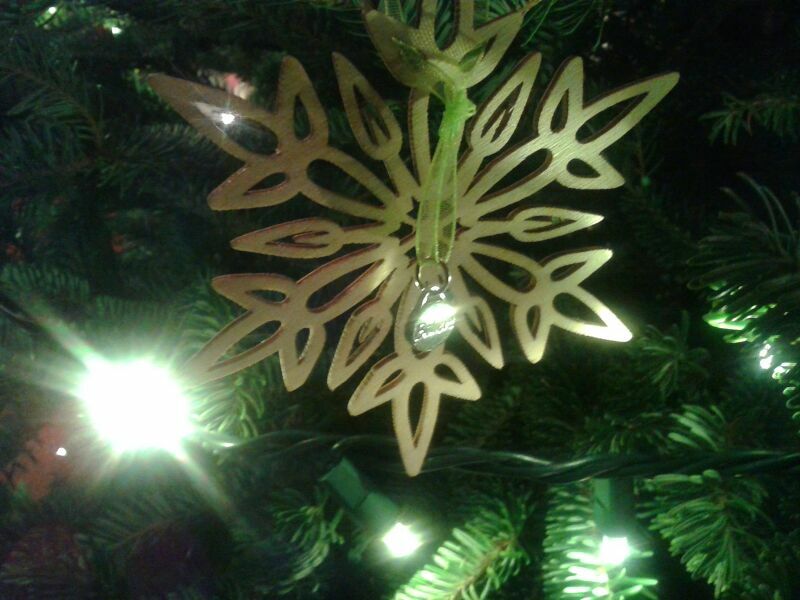 The delicate wooden snowflakes represent how unique, beautiful and fragile each of us are. And snowflakes, when all bunched up together, are pure power. 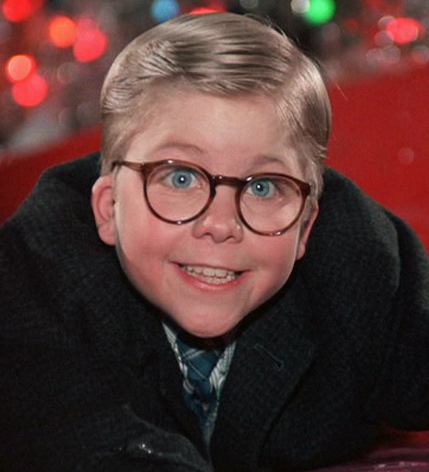 Ask Ralphie. The lime green ribbon is for awareness of a disease that will always require some form of fight. Our club color, if you will. It reminds us of what we have learned about ourselves and each other. It helps us recall every person we have met along Cancer Road — those who still fight, those who support, those who work to heal and those who we remember with tenderness and gratitude. The ribbon unites us all. The silver disk is of course the silver lining that every cloud carries. 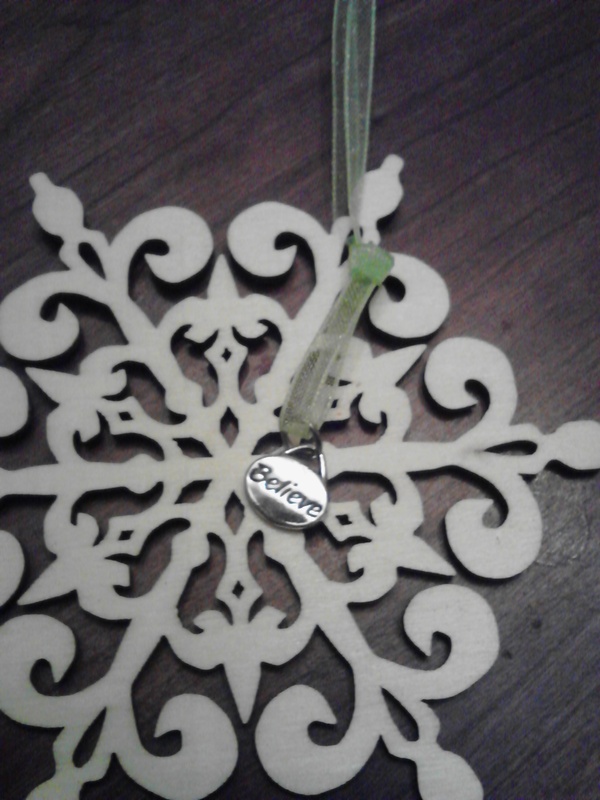 Engraved with the word ‘Believe,’ it symbolizes that which kept us all going and in many ways that which kept us sane. Small, strong, solid, ever-present and also easy to lose — it augments our little creation with the exact thing that got us to today. Never give up. Never stop. Believe. So there you have it… a glimpse at what we’ve been doing and how we’re putting a bow on 2011. Brandon is home from college and James and Tessa are almost done with school. We’re anxiously looking forward to days spent together, visits with family and friends, new memories, old traditions, warm socks and maybe, if we’re lucky, a nice little snow.